The assignment was to create an app experience for a charity event hosted by Waffle & Brew. The requirements were to choose two high fidelity screens from the list provided and to create a seamless experience where users could check in to the event locations, track their steps and earn rewards. As I dug into the brief I realized that this app felt like it could be leveraged for more than a one-time experience. During my design process, I began to think about how I could best achieve the app requirements, but at the same time build something flexible that would scale nicely in the future. 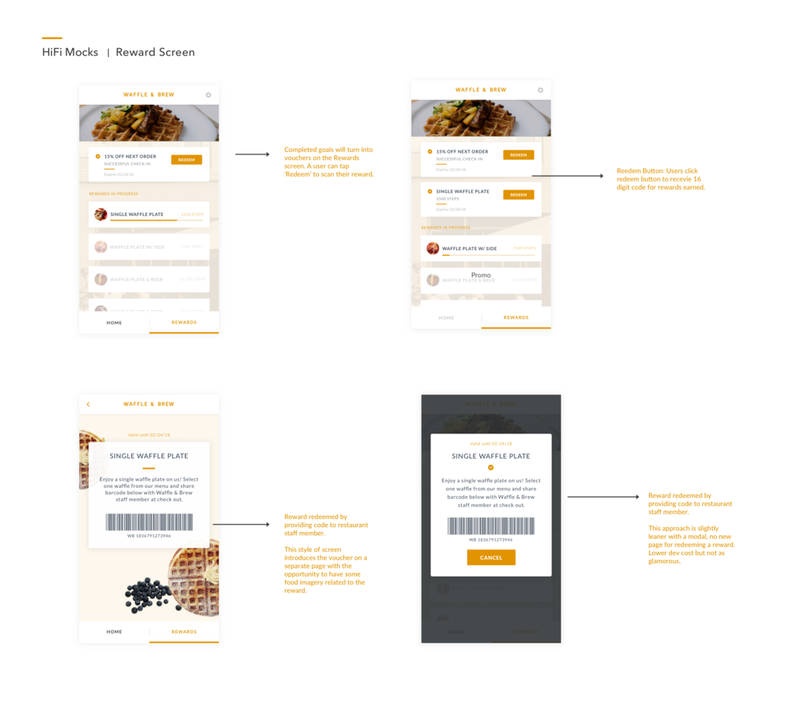 I did some initial research of the competitive landscape, exploring other reward apps and then gradually moved into creating a core set of user flows. I wanted to understand the actions users would need to take and how those would help inform the anatomy of the experience. After a few initial design explorations, I decided on a minimal and understandable approach—keeping the design simple and reliable, yet pleasurable. Once I moved into high fidelity mocks, I really wanted to take the opportunity to add imagery and a color palette that would tie the experience back to the restaurant. The design uses a welcoming color palette that feels appropriate for waffles and beer, but maintains a lightweight aesthetic overall to keep things usable. I made a quick prototype in Invision to validate my design decisions. This helped to reinforce the flow of things and make sure there were no major holes in the experience.